Like I stated in the previous article, the key to reforming habits is to keep the triggers and the rewards, but change the routine. Alcoholic Anonymous folks have a buddy system, when the trigger is pulled, simply call your buddy or mentor asap, changing the routine from alcohol to people. In my case, I knew my triggers, simply seeing new, cool looking camera. My rewards was the feelings of fullfilement: I own a camera, therefore I am a photographer. Owning that large format camera made me feel in the same lineage as Ansel Adams. Owning that 35mm camera made me feel like I was just like Bresson or Kertez or something. Fulfillment was the key, I wanted to be a fulfilled photographer. So in order to break free from the gear I simply had to do something that gave me that fulfillment that did not involve buying more and more. I said in the first article that G.A.S is like idolatry. The cure to my G.A.S was simply to shift my focus from the idol to the source. My idol was gear, the source was Photography. The more I immersed myself in photography, the more I was oblivious to gear. I started viewing gear as good, but G.A.S as a hinderence to my photographic intentions. If I wanted to be the best photographer I could be I needed to stop investing into gear and invest more into Photography. That's the simple secret. It gave birth to my motto: There is more to photography than gear. Gear is good, but it's like being in a secluded house when there is a whole earth to explore. Before I could not see beyond the camera, but now I see photography……a much more interesting subject than I would have imagined possible. If you don't believe in yourself, nobody will do so for you. Before doing anything I believed two things: I believed I would become better and I believed I would let go of the camera. It's mind over matter. If you think you will fail or if you think you will succeed, you are probably right. I made it a point that upon seeing my cameras, I make a conscious effort to appreciate them. I can safely say that I didn't appreciate most, if not all of my past purchases, so it had to change. When I look at My Ricoh GRD IV, I always say to myself how much it takes great pictures, how great it handles, how much I love having it. It makes me attached to my cameras, making me focus on what I have instead of what I do not have. When someone says online how awesome some other camera is, I immediately shift my toughts to my current gear and how awesome what I already have is. If find it a necessity to actively be grateful for my gear because I don't even want to entertain the idea that another camera would serve me better….it's the classic G.A.S excuse. A reader emailed me to say that he was researching a certain camera when he stumbled upon my website, he said I made him want to take what he already owned and go shoot. That pretty much sums it up. When I am tempted to dwell on another purchase, I just go out and shoot. If I can't, I just make a mental check to see when I can actually go out and shoot. Even if I don't follow through for any reason, it doesn't matter because the action step is simply to replace “get something else” with “Go out and shoot”. The more you take great shots with your camera the more you will appreciate it too. Sometimes it happens, you just can't go out to shoot. It's ok, there are other ways to work on your own photography. You can always go in your catalog and get a fresh Vision for your old stuff. Or you can simply do some readings on photography, how to get better, the past photographers, or maybe watch a documentary or work on your own blog. G.A.S mainly works on impulse, letting it slide off your mind by immersing yourself in photography will allow you to sober up. Many of our Magazine readers tell me that they just want to go out and shoot and be better. To me that confirms my theory that investing in one's photography will remove the G.A.S. Amen! Well, be accountable. To yourself, but hopefully with a partner. Tell your partner that you won't buy a new piece of gear and hopefully your sense of pride won't let you to do so, because if you do, you would fail in front of someone else. I didn't have a formal partner, but the unease to always give some explanations to my wife for every piece of gear was a sort of accountability. You find photographic fulfillment by working towards your photographic intent. My intent is to express myself through my photography, ergo, every step I take towards that intent made me feel fulfilled. If you want to be a pro, working each day by reading some professional books or techniques will make you feel fulfilled. Simply stated, aligning yourself with your intent will make you feel fulfilled, do that enough times and you will end up like me, instead of wanting more gear, I want more photography. The final blow to G.A.S is to get married to photography. It's like to tell that nasty boyfriend or girlfriend that they had heir chance but you're moving on by getting married. How do you get married you say? You simply create something tangible photographically. What do I mean by this? Well you can print your images, create a blog, do a project, share at a photo club, etc. Creating something tangible with your photograhy will make you have a vested interest into photography, “marrying it”. I really recommend making a blog, it doesn't have to be amazing but a modest blog will do, a tumblr is perfect. Every image you put in there will strengthen your willpower against G.A.S. because you are investing in your own photography. Even if you don't get comments it's ok because you are working on your own photography for your own pleasure. Speaking of comments….I just had a thought….what if a part of why people have G.A.S was simply because it's what gets attention online? You post about your camera you get comments, you post about your photography, you probably don't……something to think about further…. Here's how I invested in photography: I sought to make a portfolio, forcing me to actually make the images. I feel like a million bucks being the one who shot my images, a much superior and ever lasting feeling than actually buying a piece of gear for a short euphoria. The big gleaning from my past addiction, I think, is that photography and gear operate on the basis of the inverse square law. The more you invest in gear the less interest in photography. The more you invest in photography the less interest in gear. That's what my experience and my research (Lurking around forums and all) taught me, if your experience differs, I'm all ears. I broke my addiction when I got a Leica MP and an M240. All I need for my photography. It actually made me a better photographer (yes it did). Don’t need anything else now. Some days (most) my Hasselblad 500c/m and 80mm are all I NEED. Again…good read. For me, it is very easy as I stop reading dpreview.com or any of the equipment forum. Then I don’t know what is going on any more, which is good or bad equipment. Dpreview has actually helped me with compulsive purchases. If you read carefully/analyze information two things are quite clear (1) No great changes in optics for the past 20 years e.g, canon’s most acclaimed portrait lens the 135 f2 & 200mm was first marketed in 1996-97. (2) Most improvements made with digital camera bodies has to do with in-camera processing/communication between lens & camera body which can be corrected manually software. So the “aged” equipment is still as good as the new stuff if you shoot in RAW format..
You can of course make nice images with older equipment. I only have two gripes with this though. 1. It is not true that optics have not evolved. Look at all nice zooms. Who had heard of an 8-16 mm very high quality zoom before? Not that you need it to take good images, just saying. A faulty image of reality does not help really. 2. The first steps in digital photo equipment was horrible. The IQ was very low and the handling of the cameras awful. Even my Pentax *ist DS has a smallish and useless LCD. Digital cameras got “good enough” around 2005-2010, depending on what you need, and which one you bought. Great read and nice pictures. I guess I need to sign up for Gasohilic Anonymous. Sadly Excellent read! Sadly I identify a lot with you…although not in such an extreme way. I DO visit camera gear websites on a daily basis and drool over the new toys that are about to be released…but I tend to keep the same equipment for a year or 2 before changing and I rarely have more than one camera at the time…now actually being the first time as I use a Canon 6D for more pro work (not a lot) and video and the NEX7 for trips and everything else…SEE! I´m already trying to justify and now that I consciously think about it I´m probably looking for validation here. It is easy to say “now I have all I need” if you already have the latest and greatest. This does not mean you are cured. So far your post has prevented me from preordering a Sony RX1R, and instead be happy with my NEX-6 and my RX100. I thank you for that! But this is only the beginning, hard times will come as more new cameras appear on the horizon. Your blog is inspiring – in a healthy way! The RX100 is a great camera! I think just focus on shooting and it will go. The oldest one I have is Digilux2. My beloved GRD1 just recently has been put to final resting place at the bottom of Intercoastal Waterways Marina of Aventura. It served me very well for almost 8 years. Hopefully GR5 will replace it soon. Love those GR cameras, ever since my brief ownership of film GR1 back in 2002-2004. I think the point is that he has just one camera he uses without a closet full of others he bought and does not use, and isn’t looking to buy the next best thing to replace what he has now. I don’t regard perusing books and learning software as detracting from photography. There are so many skills to be learned, and I hope that the skills open up new possibilities in my photography. I am a relative newbie at digital photography, with 3 years of weekend shooting and few post-processing skills until quite recently. I think that one can’t plan a photo or get the best out of an already acquired image capture without some knowledge of PP. It is driving me nuts to have photos in my files that I know need a particular type of PP, and I don’t yet know how to do it. One thing about appreciating the gear you have – not hard, if you have taken the time to select what fits your hand and eye! Ergonomics means a lot. Difficult, if you purchased it “because you thought you had to have it to be a photographer”. The problem that was happening with the books is that I started buying them….and not reading them! Same thing for the software! There’s a link to the free presets in there (Where it says Street Presets)……. Hope you are well, enjoy! oooooo – presets! Thanks! I buy how-to and reference books in batches, and then work through them slowly. The Martin Evening LR and PS manuals have a lot of meat, at least for a novice. Great set of Articles. I can see what you are talking about plastered over the net. The main symptom to me is when people start talking about lens sharpness and resolution with no reference to how big they want to print. Its just a theoretical exercise. Almost everything here came from my limited set of stuff. Great landscapes, it’s a blow to those who believe you need the latest SLR! What a great example, I think your example is very inspiring. This last part is the killer blow to GAS. Whenever I think of buying something, I try to envision the scenerios in which I’ll use it. For example, I had the idea that I needed a flash system to photograph models, and yet all the models I knew were in Miami and would almost certainly never want to visit my home an hour away. So I researched fancy flash systems to do the shooting, but never pulled the trigger, because I knew I couldn’t justify the high cost when almost nobody would be likely to visit my home studio. This cuts both ways, though. My shooting style is to shoot in very dark environments without flash, because flash pictures don’t convey the atmosphere of the event. I started shooting with a Nikon D300, a lovely camera which has poor low light performance for what I needed to do. I got very noisy, gloomy photos that the public was right to not like very much. I was fortunate enough to have done well at investing, so I was able to afford a Nikon D4 and the fast lenses. This admittedly extremely costly investment gave me the capability to get high-quality shots in extremely low light, totally transforming my photography into something people really love. The moral of the story, then, is sometimes spending money on gear really does help. I think the difference between GAS and justifiable gear lust is that you have to identify a specific need using your existing gear first. Then you can decide whether the new stuff will help you enough to justify the purchase. So if viewing someone else’s work inspires you to do landscapes, go out with your existing camera and shoot them. Then, if you can see how more and better gear would help, you can buy it. But make sure you really want to do it first. PS If you want to get great low light shots and can’t afford a D4, a D7100 gets you about 75% of the way for 1/6th the price. But I have to admit I love my D4 and wouldn’t give it up for the world :). The album I took of the Roots Festival was done on a D7000 while my D4 was in for repair. I guess you gave me the impetus to finally leave all these cameras alone and concentrate on the target –> photography. I’ll have one last go at ebay to sell off all the stuff I rarely use but that seemed so absolutely essential…. one last chance to lose money on the stuff I bought and I’ll hopefully feel free. Finally got it – began selling off stuff, starting with the Leica CL that went this morning, and you know what…. I am happy! Took a walk and some pics on my lunch break to stop pondering what I could possibly buy with the money I got from the sale. Feels like AA, you are right: Hi, my name is Frank and I just sold an old film camera I thought I needed! Every time I have my eye on new gear, I ask myself, how many of my pictures, that don’t really convince me, do so due to equipment insufficiency. The answer is regularly: zero. I think your articles are key reading for all of us that love photography…and gear. I, like you, love to create more with less. I love hearing “You took that with your iPhone?, no way!” It’s about your eye and the vision behind the image you want to create – the camera helps you get there, but you have to have that vision. 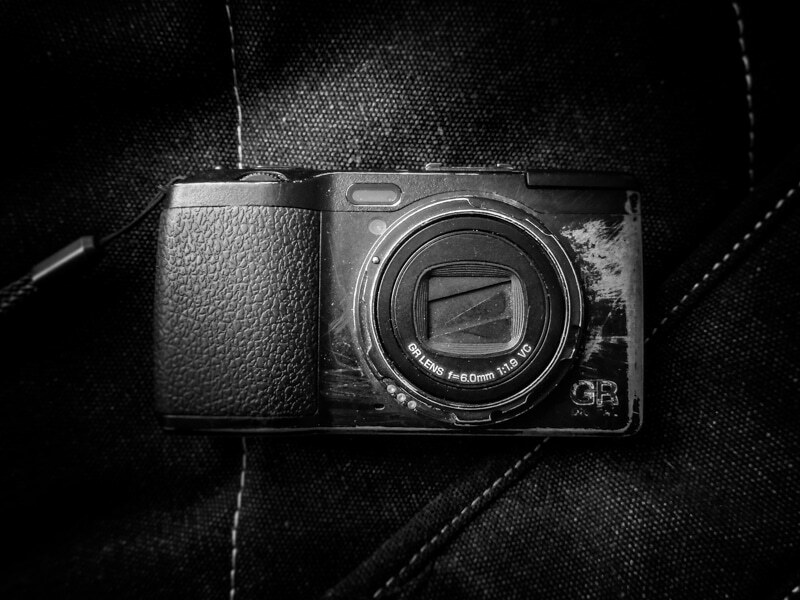 Great black and white work on resurrecting your old 5Mpx photos too – makes me want to go back and open up some of my old D100 images – I haven’t deleted anything! Great article, great to read you again Olivier, how i miss streetphotographyforum. Good luck and my best wishes for you man. A LOT of folks need to read this. Great write up. I think that most of the older folks naturally find their way into this…less about the gear, more about photography. Good job articulating my struggle as well. I’m a bottom feeder, mostly, buying all these heavily discounted and orphaned close out cameras. When it comes down to it, I get the best results with my archaic Canon 5D and cheap 40mm f2.8. The advice to do something with your pictures is also a great recomendation. Homemade art books are another way to morph your photography into something concrete. You are absolutely correct: post about gear and people read and comment. Post your work and not so much. Still, better to post work and develop that. No doubt! Huge output of article you did. Must had taken you some time. Glad it turned out to be a must read for many. I think I’d like to add it’s more important to invest on an outfit. It does not matter whether how we shoot on the street. An above average outfit is a huge confidence boost to whatever we do, camera alone does a little or nothing. Giving yourself a positive image out weights all the photographic activities on the street. After having read all three parts of your article, I have to say thank you. I saw much of myself in you and your gear addiction. As a result, I’ve foregone the new purchase I had planned. I sold off another camera that wasn’t serving my purposes at all and have planned to finish some of my ongoing projects that were stalled “waiting for better gear, so I could take better pictures”, ad nauseum. Realistically, I have everything I need – gear, software, the burning desire. Now to just get out and shoot…if only the weather would cooperate! Anyway, be well and all the best. I have thoroughly enjoyed this series. One extra thing that worked for me to shift from equipment to photos, was buying an inkjet (Canon PRO-100) and trying to print-out large (A4/A3) printouts of my “good” photos. There I realised that many photos were useless because I did not frame them well, some were not that good when seen large and many had many other issues. Now my target is to capture at least one A4+ “quality” photo after each trip or walk I make with my camera. I also saw that a good photo prints out nice, even if it comes from ancient times (like 9 years ago from my Canon EOS 300D). If a photo is crap then it does not matter if it is 5 or 8 or 22 or 30Mpixels crap. It is crap. Nice write up. My solution is to have never more than 1500 $ invested. Problem is not the latest camera body, but adding accessories, and especially lenses. So I’ll try to stick to 6 lenses only, considering that I am good at some genres and not at others. When I was a 12 year old kid just getting into photography, my dad knew a guy who knew a guy who was a pro photographer. Long story short, his advice was to remember “Give Ansel Adams a Bownie and he’ll still get a better shot than you and I will with our gear.” (If many of you even remember what a Brownie is). That grizzled veteran who won awards and had worked for the NY Times and National Geographic really left an impression on me. Have bought only 5 cameras in 47 years, and would say half were unnecessary purchases. It’s great that you started to appreciate photography and got away from G.A.S.! But wasn’t it a little extreme to make the photos in this post with a potato? Reading blogs, forums and reviews are the worst thing someone with GAS can do. Sometimes when I read a blog/photography site dedicated to amateurs and only too late do I realize that the reason why they don’t like (say) DSLRs are because people reading are mostly into street photography. Or a different kind of “snapshots” that I do. But they talk about cameras that I like! Have been going through several m4/3 bodies and lenses, but always told myself that if I could just get this or that camera my GAS would be cured. Not worked so far, but I’m sort slowing down. My biggest problem now is the morrorless market. I can’t find a camera that is “perfect” for me. Love the output from the Fuji X but after reading about color shift, focus creep and unsharp images I’m a little desillusional about my choice. I mostly use ot for hikes and perhaps a “streetshooter’s dream” is not perfect for landscape… Besides, EVF are not very good in bright light in the mountains. Or during Winter. Great article and sadly a reflection of where I used to be and in part still am. I might not change my camera’s regularly but it’s more the extra’s that I continue to justify – the pro zooms, flashes, close-up kits, pro-filters, etc. Nice to have but how often would I use each of them. Very inspiring and useful for other areas of my life as well. Congratulations on your transition from a “photographic equipment expert” to becoming a better photographer. Very eloquent posts that totally resonated with me. One thing I’d add from my own struggles with GAS: I tend to have a very strong urge to buy what I already own when I see it selling for less than what I paid–to “dilute” the losses as in gambling and stock trading. This is generally 100% bad. I have another simple trick against G.A.S. and it’s expenses. As far as cameras go, I just stay 2 or 3 generations behind and don’t care about the latest and greatest. Each time I upgrade I save A LOT of money and still ‘feel good’ about having a remarkable improvement over the camera that gets replaced. I focus on good glass instead. But also with glass I have to differentiate carefully between ‘needs’ and ‘wants’. Read the first section after it appeared on DPreview. Just read all three sections together and decided to comment. I see some similarities in my GAS, I really appreciate that you wrote and posted this topic. The comment tread on DPreview was lively on the first article. I too was reading to many gear sites and making fast decisions. Lucky I mostly bought older cameras with end of life discounts, not the latest and greatest(3 of 4 were older versions). Lucky for me I feel no need(or have the $) to have the top model, with the most mega pixels and features. I have bought lots of accessory item around a particular type of photography but have not used them enough yet(GAS excuse !) Bought zooms so I would save money by not buying 3 primes instead. But I have acquired some item to then use and be glad that I had them. It’s a hobby that requires certain accesories some of the time, which feeds the GAS very easily. Again, thanks for the writing about this taboo subject. What a comprehensive and insightful essay on GAS. This is a story that needed to be told. The insight into the psychology of this addiction is illuminated brightly here. GAS needs this treatment. I congratulate you Olivier. I too have suffered from GAS starting in 2006 when I gave up my addiction to alcohol. Alcohol was replaced with GAS. I thought GAS would be benign but its not ! 2) GAS is a true addiction with all the hallmarks, especially the impulsive instant gratification, that overrides the reflective mind at moments of fatigue or weakness. There is then remorse. But that does not last. The damage is to sleep, bank balance, and the tearing away of attention into gear and not shooting. 3) There are many motives for GAS. Mine have been boredom, reward for working hard in a professional career, wanting the very best I could get whether it were expensive or dirt cheap, the idea that good gear gets better pictures, the idea that a wide range of gear opens up creative possibilities, et cetera. Yes! but also No! as Olivier has so wisely stated. These were my motives as well as PURE IDOLATRY ! There are many others out there of course. My most expensive acquisition was a Pentax 645D bought nearly new. Its great, I love it. My least expensive item is a JML 28mm lens bought for 25 USD on Ebay. Its a simply SUPERB optic. I have 5 camera bodies and 12 lenses. But I have been through much, much, more than that. I have a Foveon camera, two infrared adapted cameras, a small, a full frame and a M.F. camera. Most of my lenses are second hand. All a legacy of 7 years of GAS. I have way too much gear. I WILL NOT SELL ANY OF THIS GEAR. And I will use all of it. Some items will be used rarely. That is of no consequence. Its all SUPERB. Selling gear is a sure route to both regret and buying more. Its a trap. Its a nasty little rationalization for the whole edifice of GAS. All my gear is capable of better photographs than I will EVER take. I NEVER intend to buy anymore as that will hinder my photography, not further it. I know I am not yet cured. But I believe I can do it. Like a reforming alcoholic I am rewriting the script. One day at a time. I will not look today at gear. I will shoot instead. In 1 years time I plan to announce to my spouse that I have not sold or bought a thing. That is my first aim. My second is to have better images under my belt ! Thoughtful and well-written observation of a malady that afflicts way-too-many photographers. I, too, fall under the mesmeric spell of artfully advertised new photographic equipment and it does take an effort of will to resist. My photography remained essentially unchanged whatever equipment I used until I joined some local photography clubs and began showing my own work at the monthly critique sessions. The focus moved decisively away from equipment to the results of using that equipment. I hope I never look back. I hope that i read your blog sooner because I’m happy when read your articles. My first camera is a Fuji superzoom in 2010, then after 2 years I buy for myself the first DSLR – Sony A300. I’m student from Vietnam so I had to work 3 part-time job to effort it. Therefore I always feel satisfied with my camera and try to be better in Photography. Now i’m using Sony A700 (all of my camera is 2nd and not the newst model) and I figured out it just hepl me in technical aspect not photography ( it has biger screen, 2 wheeler, better viewfinder). Reading this article gives me confidence to addicted to photography (not equipments). I’m a poor 33yr old sucker for lens reviews. I’m afraid I suffer from GAS. I have an outstanding 900€ aps-c camera and spent 850€ in 9 lenses. All this within the last 13 months. I repeat myself I don’t need all the stuff but the day I put that gear for sell never arrives. I think I could live with my 28mm and 50mm but the rest of my lenses is pure old jewelry. Not easy to say goodbye. I think I have a problem. First off….850 for 9 lenses is actually not that bad at all!!! Holy cow. Thank you so much for this series of articles. I just bought my first DSLR a few months ago and immediately started dreaming about a better model and/or better lenses. You talked some sense into me today! Wow did this ever hit home. I think I was (and am if I don’t pay attention) just like you. I have an addictive personality; I’m ALL IN on things until they are exhausted then going for the next “high” which of course doesn’t last long. I cringe at the amount of money I’ve wasted on stuff…I finally just got rid of it all and have one little camera; a Fuji X100T. I shoot with that and don’t worry about what I can’t do with it. One of these days there will be a legitimate successor to it that I will get but not like I used to with the “incremental” step up that you described. Thanks for the sobering warning again…I needed this. Great article. I agree GAS is no substitute for actually using what you have. Years ago I looked through the waistlevel finder of a Hassey 500 followed by years of 35mm gear. When I made the jump (before digital) I would carry my equipment religiously. Then airport security and digital occurred. I put my 2 1/4 away and lost interest. Today the 2 1/4 is out and my interest is rekindled. I wait like an egar child to see the Ilford scan returned and marvel atthe silver prints. The splendor of a ground glass image makes me question why I ever left. Sure I have my P&S and bridge digital, but for engaging purposeful work (beyond making my family memories) my opinion is the manual film process is photography. Great article, also for those needing a bit of motivation. And your photos are amazing! I went through a period of this, eventually I started selling all the equipment I didn’t use, next on the chopping block is a Mamiya 645 Kit as I simply do not use it, maybe I can put the money towards a trip to Cuba to shoot. These days I shoot with a Nikon F5 for film, and a D7100 for digital, it’s all a photographer needs in terms of what I do. Just read this and cancelled an ebay bid that is/was/probably, would have been a big mistake !! Cheers. Beyond cameras and equipment, beyond film and chemistry, beyond pixels and technology lie the mysteries of the creative life shared by those who strive to communicate and express themselves clearly. Just found your site/mag/articles while I was researching a new camera system. This article is great and made me realize I already have great equipment and really need to go out and start using it. Thanks for doing what you do. You have a new fan.